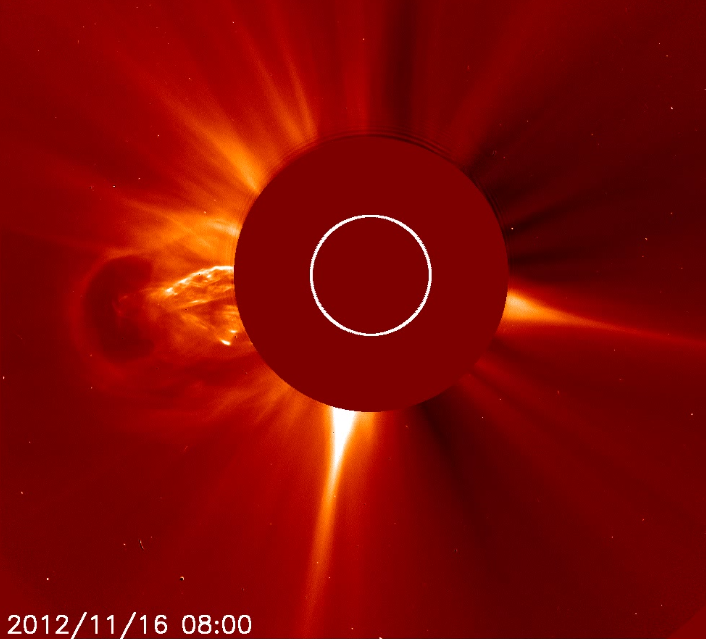 At 07:51 UTC, November 16, 2012 a C1.4 solar flare peaked from Active Region 1613. About the same time, a large solar prominence was observed off the Sun's eastern limb. Prominence produced Coronal Mass Ejection (CME), however it does not appear to be Earth directed. Both events can be seen in SDO movie attached below. A prominence is a large, bright feature extending outward from the Sun's surface, often in a loop shape. Movie credit: NASA/SDO and the AIA, EVE, and HMI science teams. Featured image: Courtesy of NASA/SDO and the AIA, EVE, and HMI science teams.